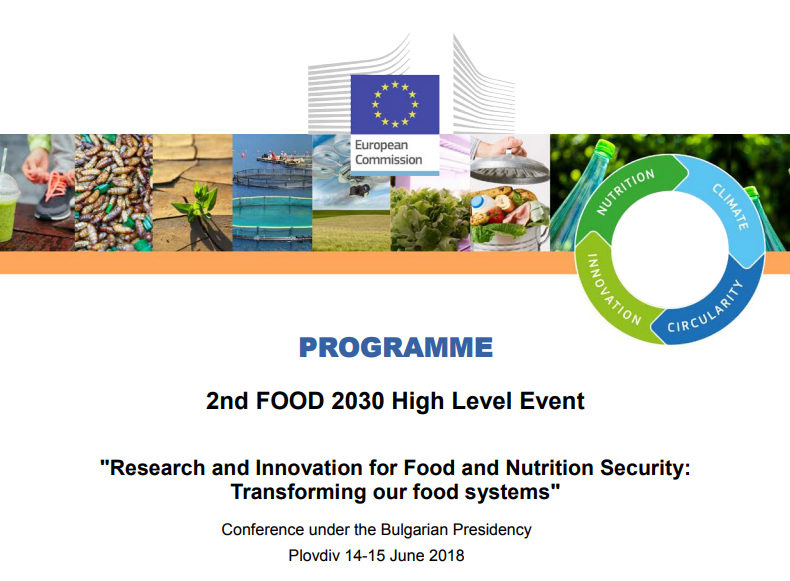 On 14-15 June 2018, Agroknow representing AGINFRA PLUS project, participated at the 2nd FOOD 2030 high-level event, a Flagship Conference dedicated to Research and Innovation (R&I) as a driver of sustainable food systems transformation that the Bulgarian Presidency of the Council of EU organised. Such a transformation requires a new way of doing science, research and innovation that puts the food system at the centre. This is a means to ensure food and nutrition security in a changing world and the combined pressures of climate change, resource scarcity, biodiversity decline, malnutrition, shifting demographics and migration. The systemic approach, as called for by FOOD 2030, requires linking land and sea; connecting producers to consumers – and back, in order to achieve four overarching priorities: nutrition for healthy and sustainable diets, climate and environmental sustainability, circularity and resource efficiency, innovation and empowering communities. The conference program featured plenaries with keynote speakers, parallel breakout sessions with interactive panel debates, a cultural performance and an exhibition space showcasing innovative research initiatives, networks, start-ups and sustainable food technologies. Additional side events took place on the day before the conference.